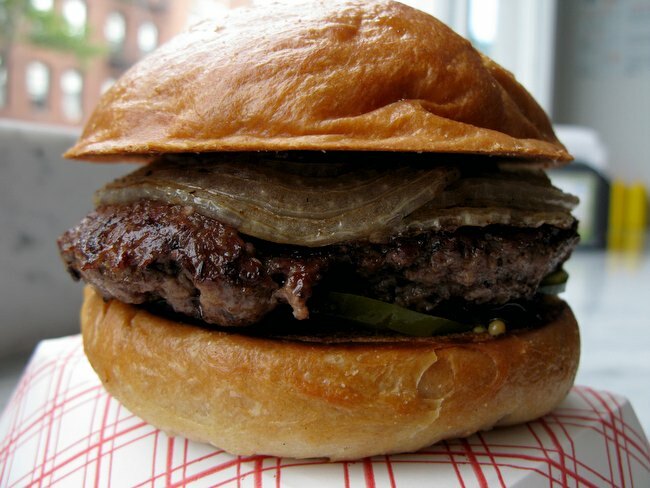 Carroll Gardens' Vinzee's onion and pickle burger is a delightful affair. Meat from Los Paisanos. When I told friends I was going to check out Vinzee’s Magic Fountain on Court Street at First Place, most asked, somewhat incredulously, “Really?” Most of their responses, I think, are a reaction to the restaurant’s choice of signage font. As silly as that seems, Carroll Gardens and the rest of brownstone Brooklyn has become a place where there are restaurants that use designer-font signage, and there are those that don’t. Vinzee’s does not. At this new family-friendly burger joint in the heart of Carroll Gardens there is none of the old-timey polish that involves reclaimed wood, young men in mustaches or artisanal anything. Instead, the restaurant—going for the 50s main street diner vibe—employs shiny metal–toped tables, white vinyl and metal chairs with a bright red accents. The spacious flower-lined patio offers rather bucolic street-corner seating (the paving of the yard for cafe seating was controversial, as it violates an unevenly enforced protection of Carroll Gardens’ historic gardens). The wood floors, brick walls and marble counters are a little incongruous with the overall look. Bright red and yellow bottles topping each table point to the restaurant’s true intentions. The burgers come out particularly well. They are, according to the menu, fresh, with meat ground daily — and they taste it. Served on a large bun, the cheeseburger ($6.18) comes topped with lettuce, tomato, ketchup, mayo and mustard for no extra charge. The griddle burgers are served medium-well and impart a beefy flavor that’s as likely to please a small child as the adult nostalgic for the Dairy Queen era. It does, however, seem a bit much to charge an extra $1.44 for a pickles and onions burger ($7.14 vs. $5.70 for a regular burger). The odd and sometimes high pricing will do more to stand in Vinzee’s way than its font choice or decor. The equally good hot dogs are foot-long affairs that come with a variety of toppings ranging from the Relishious with pickle relish and mustard ($5.85) to the Carlito’s Wand with chopped onions, shredded cabbage, mayo, Vinzee’s parsley sauce, honey mustard and Parmesan cheese ($7.32). The beef dogs have a snappy all-natural casing and taste more sausage than water dog. Still, my pocketbook can’t help but think about Shake Shack’s most expensive dog, which is just $5.40. The thick-cut, well-salted fries ($3.10) get a bit soggy if not eaten promptly, but are adequate accompaniment to a burger or dog. While I didn’t try them, onion rings ($4.77) are also available. There is a rather long list of menu categories (sandwiches, pizza, fish, salad, appetizers), but the ice cream will probably get the most attention. Soft serve comes in a waffle cone, and ice cream is served up in sundaes, egg creams, soda floats and shakes. It’s not the best ice cream in the neighborhood. But our strawberry shake ($6.70) pleased my 3-year-old son to great degree. My husband and I had to fight for sips. My son also made his way through half of his rather large, buttery and uber-cheesy grilled cheese ($4.08) without too much prompting. This probably gets to the heart of Vinzee’s appeal. It’s a casual spot for a burger and milkshake that is going to please 3-year-olds and 13-year-olds without fail. On the plus side, the staff goes out of its way to welcome customers. Kids are given coloring pages and crayons; booster seats are stacked high. We were asked several times if our food was to our liking. Everything from the bathroom to the floors was spotlessly clean. The true test of Vinzee’s will be when the two competing burger joints open up on Court Street—Five Guys at 266 Court Street and Moo…Burger Barn at 240 Court Street. Another question is whether the city will allow Vinzee’s to seat customers in its paved outdoor courtyard. According to the Brooklyn Paper, the Buildings Department never gave the owner the authority to pave over the garden on the First Place side of the building. The garden lots in Carroll Gardens are protected as public property by an old zoning law, but the city enforces the law unevenly. Dunkin Donuts for instance uses its outdoor patio for seating, as does PJ Hanley’s. Read about Court Street’s sandwich and burger explosion. And Shake Shack heading to Fulton Street. Is the pizza borough getting taken over by burgers? i wish them well, but i think they’ll do a lot better if they drop their prices around 30 percent. i don’t know how many times i will like to buy my daughter a $4-plus soft serve ice cream cone when you can get a great scoop of gelato at monte leone’s for $1.50. and it’s not to type of place that warrants $5.70 for an unadorned burger.